Meadows Park as viewed to the northwest from the southwest edge of the area. Meadows Park is the name of a large, public park and its adjacent community in northern Dukes. It is bordered to north by Dukes Bay; the Dukes Bay Bridge, Hewes Street and San Jacinto Avenue to the west (Steinway and East Island City); Charleston Avenue and Savannah Avenue to the southwest (Cerveza Heights); Tudor Street to the southeast (Meadow Hills and Willis); and the Broker-Dukes Expressway to the east (Francis International Airport). The residential area of Meadows Park along Savannah Avenue is reminiscent of quaint, upscale neighborhoods in New York City such as Brooklyn Heights and Gramercy, featuring rows of brownstones. The park area itself appears to features remnants of a world fair organized during the 1960s (alluding to the 1964 New York World's Fair), with only a few reminders of the event standing. Portions of the park has since been converted for other recreational uses (including a series of outdoor tennis courts and a baseball field), but the park has generally remained lush with trees and fields. The park is notably home to The Monoglobe and Liberty State Pavillion Towers. Other noteworthy structures include a solitary building fronting the Monoglobe that houses tennis courts and an ice skating rink on one side and a museum on the other, and two bronze statues, each depicting a male and female, seen between the building and the Monoglobe: One in the middle of a pond, and the other between the pond and the Monoglobe. Meadows Park is based on Flushing Meadows Park in Queens, New York. Its Monoglobe is a replica of the Unisphere, while the Pavillion Towers are obviously supposed to be the New York State Pavilion. The building standing just north of the Monoglobe is a scaled down replica of the Queens Museum of Art, while the statues between the building and the Monoglobe are expanded reworking of Donald De Lue's Rocket Thrower. Both real-life inspirations are located within Flushing Meadows Park. 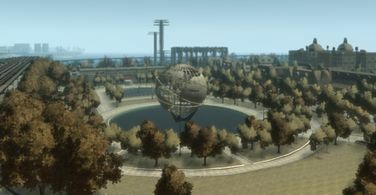 The Liberty City Subway does not stop at Meadows Park, even though it runs along half of the perimeter of the park, even cutting through it at one point. However, Huntington Street station, in Cerveza Heights, is only a very short distance away from Meadows Park and may be used by its residents. The Liberty State Pavillion Towers. This page was last modified on 27 April 2012, at 22:22.